Saudi Arabia fears Iranian influence – its Bahrain intervention has echoes of the Soviet reaction to the 1956 Hungary uprising. The Persian new year is upon us. Today millions of Iranians, Tajiks, Kurds and Afghans celebrate the new year with close friends and family. Over the next few days, millions will either be on holiday, or visiting friends and family to wish them Happy Nowruz. To all those who celebrate Nowruz, please allow me to wish you a wonderful new year ahead. I hope 1390 will be a year of health and happiness. I wish the people of Iran whatever they wish for. I just want them to know that they are not alone and that millions of people around the world care for them and are with them, especially Israelis of Iranian origin. I enclose with my favorite song of the year from the Iran based band “Sasy Mankan”. This video was filmed in Iran. These guys are truly excellent. Its OK to find yourself dancing uncontrollably. It has already happened to many of us. The recent article from Haaretz which indicates movements in the Netanyahu administration with regards to the peace process shows at least one ground breaking development in Likud, and raises the possibility of another major domestic development. For years Netanyahu and his Likud allies have defined the Palestinian demographic figures as lies and fabrications. They have denied flat out that any possibility exists that the Palestinians in the occupied territories could outnumber Israelis in 20 years time. Very often they have accused the Palestinians of lying about their birth rates. The new statement shows that Netanyahu has now come to accept the question of Palestinian demography and how it will be a powerful factor. That indeed if Israel does stay in the West Bank, it could lead to the end of Israel as a Jewish, democratic country. The importance of this new development must not be overlooked, nor underestimated. This new development could either lead to new elections, or an alliance with Kadima. Its very unlikely that Netanyahu can move forward with his current coalition. The one person to watch out for is Lieberman. A decision to move forward with the peace process could bring Likud closer to Kadima. This will reduce Yisrael Beitenu’s leverage. The isolationist camp in Israel, have stated that recent developments in the region actually justify settlement building. To this camp, there are only three important political entities. They are The Israeli government, the US government and AIPAC. Everyone else is irrelevant. The reality is different. The world is a much bigger place. The state of Israel is a sovereign and independent country that is situated in the Middle East, and not in the Mid West of United States. Our neighbors include Egypt and Jordan, not Texas and Oklahoma. 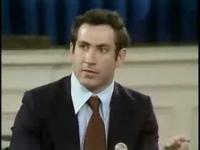 In 1978, in a US TV show called “The Advocate”, a 28 year old Israeli representing himself as Ben Nitay (an absolute must see) amongst other things , hoped that all Arabs will one day have democracy. Benjamin Netanyahu seems to be noticing how Ben Nitay’s hope is being slowly realized. Israel must move forward and engage the new and democratizing Middle East. This is no time to retreat and hunker down behind the walls of West Bank’s gated communities. To the current Israeli government, the Iranian nuclear program is an extremely serious threat. Previous Israeli governments have also had the same view, but no government has emphasized and highlighted this threat more than the current government. Netanyahu’s government has also reiterated its commitment time and again to international efforts underway in the UN and elsewhere to isolate Iran. When it comes to rhetoric, this is absolutely true. But in reality, and judging from its actions, Netanyahu’s commitment to building and expanding settlements is stronger. It seems clear that in action, to him and his coalition partners, settlements are more important and are the priority and not Iran.